Cover of the Daily News' 2018 Eagles season preview. It's the moment you've all been waiting for: Football is back. The Eagles will begin their title defense with a tough matchup against the Falcons on Thursday at 8:20 p.m. Whether you'll be watching from the comfort of your own fan cave or with 69,000 others at Lincoln Financial Field, you'll need to be prepared. That's where our Eagles' season preview comes in. 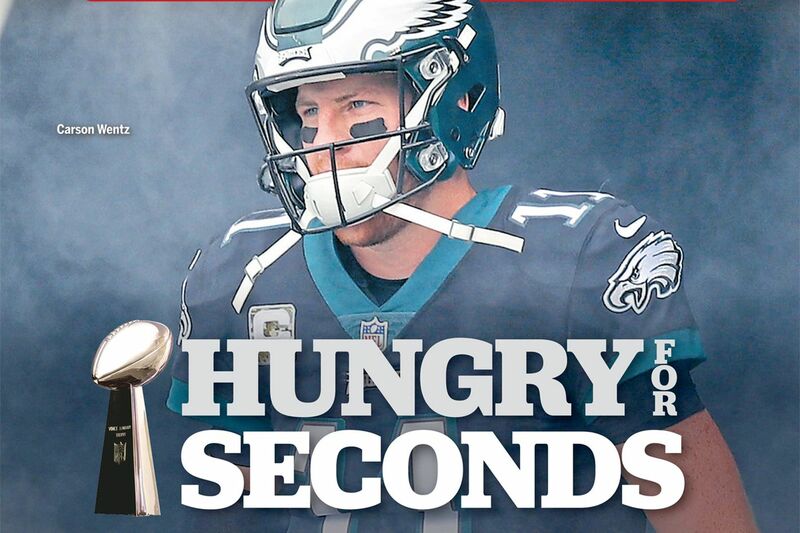 The Philadelphia Inquirer’s Eagles special section cover. Eagles season preview: The long, arduous countdown to Carson Wentz's comeback | Marcus Hayes: Eagles' biggest hurdle in repeating as Super Bowl champs will be overcoming loss of Frank Reich, John DeFilippo | 50 things to know about the upcoming season | Which Eagle, who didn't play in the postseason, will have the biggest impact? | Eagles' roster reconstruction reveals they have a type: Experienced players on short-term deals | What roster holes should the Eagles worry about? | Previewing the NFC | Previewing the AFC | Bob Ford: Repeat as Super Bowl champs? The Eagles can learn from teams that did. | David Murphy: Do the Eagles have what it takes to establish a dynasty? | Super Bowl carryover – good for this year's Eagles or bad? | Will Carson Wentz return to MVP form? | Nick Foles is starting for now but is OK with eventually stepping into background | Eagles 2018 roster: Breaking down the depth chart | A recipe for repeating: What the Eagles need to do to win another Super Bowl | Mike Sielski: The Eagles won a Super Bowl by being innovative. So what's next? | What will determine if the Eagles contend for the Super Bowl? | Which NFC East team poses the biggest threat? Carson Wentz walks through the team tunnel before the Eagles’ preseason game against the Jets last Thursday at Lincoln Financial Field. Carson Wentz tore his ACL and LCL 267 days before the 2018 season opener. Jeff McLane details where his journey back to the field took him, and what he discovered along the way: Read the story here. Doug Pederson and Howie Roseman share a fist bump during training camp. Valuing 'low risk, high reward' players with experience helped bring the Eagles their first Super Bowl. As the Eagles' enter their second season building a contender, it's becoming clear what type of player they are targeting. Read the story here. Eagles defensive end Brandon Graham celebrates winning Super Bowl LII. Will the Eagles suffer from a Super Bowl hangover? • Which Eagle, who didn't play in the postseason, will have the biggest impact? • Will Carson Wentz return to MVP form? • What roster holes should the Eagles worry about? • Super Bowl carryover – good for this year's Eagles or bad? • What will determine if the Eagles contend for the Super Bowl? • Which NFC East team poses the biggest threat? Vince Lombardi is carried off the field by his Green Bay Packers team after they beat the Raiders in Super Bowl II. Lombardi’s teams were one of nine to repeat as champions. The Eagles are now in pursuit of joining an elite group of teams: The ones who have repeated as Super Bowl champions. Bob Ford dives into what they can learn from previous back-to-back champs. Read the story here. In the same vein, David Murphy explores the biggest hurdles the Eagles will need to clear to reach dynasty status. Read the story here.